The most premium carpet graphics for your bass boat carpet. Featuring the highest quality 3M Adhesive and 3M Armor Coating these graphics are your only choice for the longest lasting carpet graphics. They can also be removed. Our 3M carpet graphics are scuff-resistant, slip-resistant, and have excellent resistance to wear from high foot traffic. 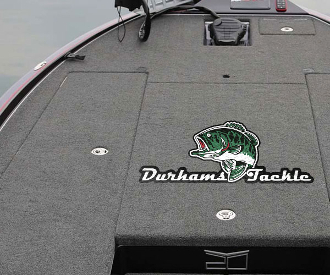 High Quality DurhamsTackle Vinyl Decals for your bass boat, tow vehicle. These graphics are printed on high quality outdoor vinyl and overlaminated for extra protection from UV rays, and light bumps and bruises. These are high end decals that have “air-egress” channels built in meaning it’s near impossible to get bubbles, they just rub right out! They are applied dry -no soapy water, no windex, no fluid!- They can also be removed.